AiPT! 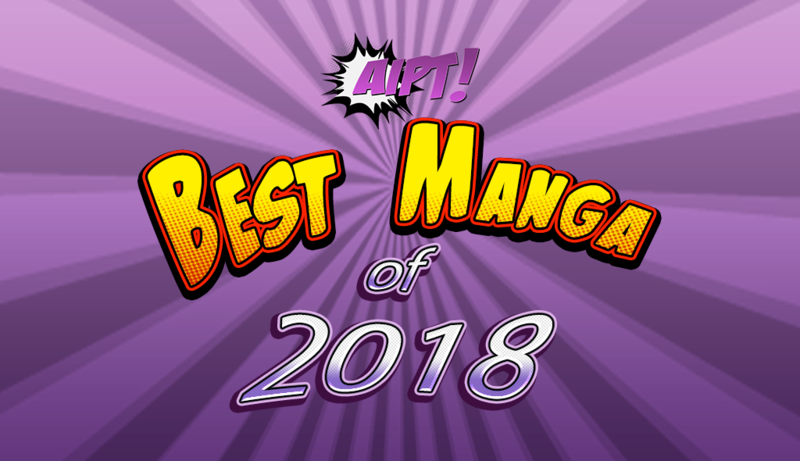 's best manga of 2018 – AiPT! We think back on the year’s best manga series. My favorite manga (and comic in general, regardless of where it’s from) right now is easily The Promised Neverland. I’ve had a few frustrations here and there, but by and large the series has continued to deliver amazing moment after amazing moment. Last year saw the end of the Goldy Pond arc featuring Leuvis, arguably the series’ greatest villain to date. Yugo, Lucas, and Emma all got great character development, and there were reveals aplenty about the nature of the world our protagonists are struggling to survive in. As consistently good as the mysteries were all year, the suspense in 2018’s final chapters were among the best. Of course, the series’ success also owes a lot to Posuka Demizu’s visuals. As far as I’m concerned, she’s the best comic artist working today. Her depictions of Emma and co. fighting off Leuvis with cunning and flurries of bullets were among the best action scenes of the year. Note: While Dr. STONE technically debuted in 2017, it didn’t receive tankōbon releases in English until 2018. One of the best new series out in America is Dr. STONE. This manga introduces fun character dynamics between its characters with quite an original premise. The series is beautifully drawn too. The best part is that there’s real-world knowledge imparted to the reader about sciencey stuff. This helps ground the narrative, which is set in the far future, in some semblance of reality. Some stories are so relatable it hurts. Such was the case when I read That Blue Sky Feeling last year. Okura and Coma Hashii’s depiction of Sanada, a closeted high school student, hit so close to home I had to put the book down at points. The level of nuance throughout is really amazing; the creators do a great job conveying the interplay of truth and lies that’s common in young queer people’s lives. Sanada wears different masks around different people, and even the reader is never quite sure when–or to what degree–he’s being genuine. There are no simple answers, but the obstacles Sanada is clearly dealing with are gut-wrenching. All in all, this was easily one of my favorite comics of the year. What a year for queer slice of life! Syundei’s adorable series published by Seven Seas mixes comedy, longing, and octopi into a charming, relatable read I couldn’t help but dissect for deeper thematic depth. This series really captures a common kind of pain for many queer people–adolescent affection for someone who’s (presumably) straight–and conveys that feeling in a way that doesn’t bog the series down in angst. Not that angst isn’t cathartic now and then, but if you’re looking for a fun queer read with a lot of heart, Go For It, Nakumara! should not be missed. Few comics amused me as much last year as Takane & Hana did. The zany premise–girl meets boy while masquerading as her sister at an arranged marriage meeting–is further augmented by the characters’ extremely stubborn personalities. Takane and Hana aren’t the only dramatic ones, either; the manga’s supporting cast contributes a lot to the fun as well. With all that said, a lot of the series’ humor comes from Yuki Shiwasu’s art. The series’ exaggerated facial expressions are some of the best I’ve ever seen. The shading and patterns throughout are lovely as well. Out of all the manga I read last year, Takane & Hana was consistently the most enjoyably lighthearted. I was expecting to enjoy Satoru Noda’s gory yet gleeful, exciting yet educational, high-stakes yet hilarious turn of the century story of a former soldier and Ainu girl’s treasure hunt. I was not expecting to enjoy it so much that I binged all seven of the volumes Viz has localized in a matter of days. From the gorgeously drawn animals and mouthwatering food to the excellent characterization, Golden Kamuy has become my favorite ongoing series. There are times where the plot will more or less halt as Sugimoto and Asirpa break from their search for a legendary stash of gold to hunt an animal, and these are my favorite parts. The amount of research and knowledge Noda displays with his detailed explanations of Ainu hunting methods, traditions, architecture, etc. is astounding. Even if there was no gold to find and the series was just Noda’s immensely likable characters explaining how to properly season various animal brains for consumption, I would still read it. Good thing the overarching plot is just as compelling! Comedy and drama can be tricky to pull off right together in many mediums. If not properly integrated into the story, the comedy can kill the mood of the drama while the drama can clash terribly with the laughs. Silver Spoon does not have that problem, as it’s expertly written and drawn by the creator behind Fullmetal Alchemist. It tells the tale of a young man, not knowing where to go in life, enrolling in a dairy science program out in the middle of nowhere. The series provides plenty of laughs through the culture shock our main character gets as he navigates a world of farming and animals he really doesn’t understand in the slightest. However, the story also hits on the hardships he faces at school and at home while also introducing the worries and concerns that his classmates hold. It’s a slice of life combined with a coming of age tale, all slathered over with a fantastic dose of comedy that keeps things generally fun. This title is definitely worthy of your time. What happens when you take the normal, average genre known as slice-of-life and smash it together with science-fiction dread from above? You get a quirky and downbeat, but still weirdly upbeat, series from Inio Asano. It tells the tale of a couple high school girls moving through life and eventually heading into college as a menace floats ever quietly above. A giant spaceship appeared several years ago, killing thousands in its arrival but doing nothing else. Despite the ever-existing threat to life as our characters’ know it, this is a surprisingly fun title. This is not a series that bathes in the misery of its characters like the creator’s previous series, but one that explores the daily lives of some girls trying to find their ways in life. It’s down-to-earth and rather realistic in the characters’ problems and worries, while also having this fascinating backdrop to it that’s filled with social satire and commentary. The artwork is beyond amazing as well, so wonderfully detailed and laid out with tons of little jokes and moments crammed in. Without a doubt in my mind, this is truly one of the best sci-fi series you’ll experience. Posuka Demizu is my favorite artist currently working in comics. Her style is so unique and overflowing with energy, and she can convey just about any tone imaginable. She’s most known for her work on The Promised Neverland, where she delivered fantastic work all year. She’s imbued the series with fantastic action and mystery, and her character designs are charmingly detailed. TPN also had some of the most striking horror visuals of the year. Posuka’s eye for detail is great in both sentimental moments and in her depictions of the grotesque. From human characters to monstrous demons to the flow of motion across panels, Demizu excels on virtually all fronts. TPN owes an unquantifiable amount of its emotional impact to her work. Hot off the heels of Devilman Crybaby, Seven Seas Entertainment released two hardcover editions last year reprinting Go Nagai’s original ’70s Devilman manga in its entirety. The quality of the collections is great, both in terms of the manga itself as well as the presentation. The hardcovers are well-made and look great on a shelf; their covers are adorned with bold red shots of protagonist Akira Fudo in both his human and Devilman forms. In addition to the original manga, these collections also reprint the noncanonical Shin Devilman series. These chapters aren’t as good as the series proper, although they are still interesting in an archival sense. Devilman is a classic, and with good reason. It’s full of energy, with some of the most over-the-top gore and sexuality you’ll ever see in any comic. Not only that but it’s quite emotional as well, and it features a major gay character (Ryo) who’s shockingly well-written and relatable despite the era when the series was first published. Newbies be warned: Devilman isn’t for everybody, but if you’re down with extremely explicit and demented media then it’s well worth your time. Kodansha’s new reprints of Takeuchi Naoko’s Pretty Guardian Sailor Moon are the definitive way to experience one of the most iconic works in magical girl canon. The art has been blown up through the extra large format and the volumes are bound in glossy, holographic covers fit for the Crystal Kingdom. Each volume also features some great translation notes in the back which enriched my understanding of some of Takeuchi’s references and naming conventions. For those who don’t know, Sailor Moon is the story of crybaby middle-schooler Tsukino Usagi awakening to her powers as Sailor Moon: a magical warrior who must defeat the Dark Kingdom and still find time to study for tests. She and her Guardian friends search for Princess Serenity and the Mystical Silver Crystal (name varies by translation) in the hopes of defeating the evil Queen Beryl and her Kings of Heaven. Catch all those fantasy buzzwords? Sailor Moon helped pave the road for the magical girl genre and Takeuchi’s elegant, intoxicating artwork should always be experienced in the new Eternal Editions.